I was recently tasked with conducting an assessment on our instructional design process and how instructional media is selected. The assessment reveled we really didn’t have a process. This may or may not be a problem depending on your business model and how the training function fits in. But, if on occasion you have a need to champion how you design your training it could be the shield required to deflect off your challengers. In this blog I thought I would share some of my experiences that may be of value including some terms, misconceptions and some considerations when selecting media for instruction. As instructional designers we are schemers. We engineer the environment with a deliberately arranged set of external events designed to support internal learning processes. These are the methods we use to initiate and reinforce learning. We do this by communicating: goals, facts, concepts, processes, procedures, attitudes, etc… etc… This information is transmitted via a medium. Media include: realia , radio, television, computers, tablets, and print to mention a few. The media communicate our message via modes. Modes relate to our sensory system. Modes include: audio, visual (graphics), touch, and text. In this blog experience what method(s), medium (media), and mode(s) are being used in section “Revisiting the Terminology” above? The answer is in the lower portion of the column on the right. The idea that the “newest” media is somehow better than older media goes way back. As advancements in communications technology began to offer new ways to communicate, each new development came with the hype that it would revolutionize education; television, video disk, computers... Well at least the technology was revolutionized but the process of how humans learn remains the same. In 1983, Richard E. Clark published the legendary article, Media Will Never Influence Learning in the journal of Educational Technology Research & Development. The article sparked a lasting debate about media by stating, “Media are mere vehicles that deliver instruction but do not influence student achievement any more than the truck that delivers our groceries causes changes in our nutrition”. It turns out for the most part Clark was correct. Fifty years of media research comparing one media to another supports this fact. Which Medium is the Right One? Which media will work best? The answer is subjective at best and the answer will vary from situation to situation. It can be as simple as using whatever resources you have at hand. Like opening up the refrigerator and deciding what’s for dinner based on what’s in it. On the contrary, decisions involving thousands of employees and even more dollars with certain political fallout aren’t as easy. Further complicating the decision is what once were considered distinct and separate delivery technologies are increasing converging. This is evident by the language we use to describe it, specifically “multi-media”. Now we have devices that can combine the various modes into one delivery system such as computers, tablets, and smart-phones; all able to connect in our Post-Internet world. The key to guiding this decision is knowing the target behaviors and the conditions under which the behavior is to be performed. At this time the words “ learning objective” should be flooding your neural net. With this knowledge you can begin to either select or eliminate potential media. 1. Is realia essential for mastery? It’s the real thing, or at least a model of the real objects. If you want to teach a person to lay bricks; you will need a supply of bricks, motor, and tools. 3. Mass media vs. One-to-One or One-to –A Few. Does mastery of the objective require individualized instruction and feedback? Some instructional situations will need a blended approach to support different kinds of learning. Media selection can be driven by the categorizing the learning objectives or learning outcomes. 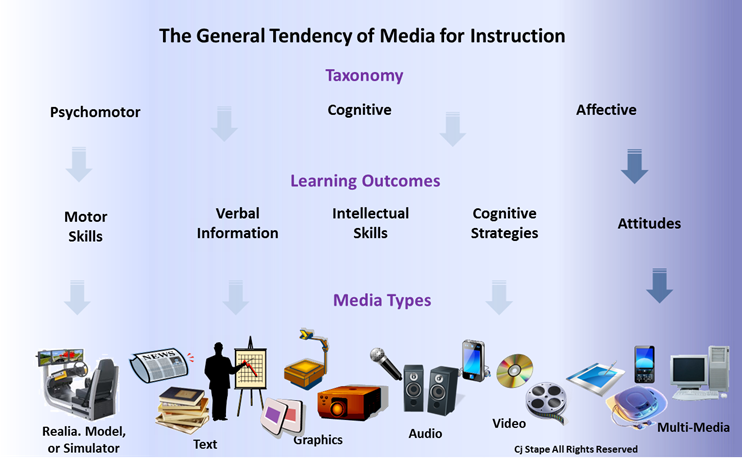 These can be used as a general guide toward media decisions in that the advantages and disadvantages of each media yield a general tendency to support various learning methods. Learning objectives can be categorized into domains or in the kinds of learning outcomes. Think Bloom’s Taxonomy (Cognitive, Psychomotor, and Affective) or Gagne’ learning outcomes (Intellectual skill, Cognitive strategies, Verbal Information, Attitudes, and Motor skills). In addition to the technical and practical considerations, Newby, et al (3) have developed a series of questions and a checklist to aid in determining if a particular media would enhance learning. These questions consider instructional design process considerations blended with compatibility to various methods. For example: Does the media… “Allow the order of material to be easily changed?” See: Newby Checklist. In my experience, the practical considerations seem to carry more weight than technological ones except for the need for realia. And, for the most part, media decisions are made in a fairly informal way. I am making a version of a “Selection Process” I developed available to you as what I hope you will find a defendable process if ever you need one. Constructive comments welcomed. 2. Romiszowski, A. J. (1990). Designing instructional system: Decision making in course planning and curriculum design. New York, NY. Nichols Publishing. 3. Newby Timothy, J. Stepich Donald, A. Lehman James, D. Russell James, D. (2000) Instructional Technology for Teaching and learning: Designing instruction, integrating computers, and using media. Second Edition. Merrill-Prentice Hall. Upper Saddle River, New Jersey. A practical, commonsense approach to media selection! I'm hoping to move instructors from their default position, "let's film my lecture!!"